Hello I hope everyone has had a lovely weekend! I have had a nice one. I went to Bury yesterday and went into the Simply Be shop and ended up spending more money. And had a lovely lunch at Frankie and Benny's, with their great £10 off offer they were doing yesterday. And today has been full of laziness and baking cakes, perfect Sunday. 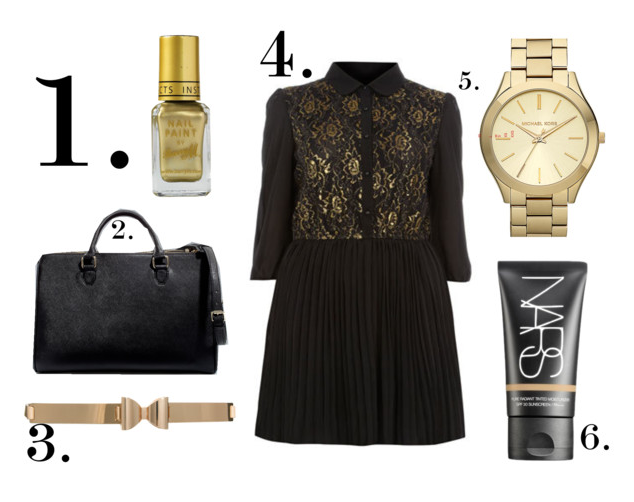 Somewhere along my hectic schedule today I managed to put together a little wants list. I've gone for a bit of a glitzy feel this week with the black and gold. What have you been lusting after this week? Barry M do great, affordable nail varnishes that always hit the trends on the head. They released all of the patterned varnishes recently, which I wasn't a fan of massively. But this gold foil one looks amazing. I've tried cheap gold nail stickers from Primark, but this looks like it would be easy to apply, and quick for those last minute Christmas nights out. Zara has done it again and created another hit bag with bloggers. And I've been sucked into it. This one is just perfect, it looks like a great size, and has zips which means I won't be paranoid about people being near my bag and suspecting everyone as a thief. I'd probably use the long strap but it looks like a simple bag great for days at the office. Hence it's name, I presume. I presume I've had this on one of these lists before. It went down to 12.50 and is such a great little belt. I'd wear it with a black skater dress and tights to dress it up a bit and make it cute. I love, love, love this dress. It has everything I need in a dress. It's black which is the best. It has gold details, a collar and a pleated skirt. It's a great office to drinks dress, worn with a blazer and pumps in the day and heeled boots and a leather jacket for drinks. I may need to pick this up on my next pay day! Another blogger favourite. This is a lovely watch from the Michael Kors selection. I quite like the traditional coloured gold as it would go with more stuff in my wardrobe, but I do love the rose gold one too. If I had a fella, which I don't for any unsuspecting men who may have stumbled onto my blog, and they're interested ;), and he was buying me a present, I'd leave huge hints as to wanting this watch! But I don't, so I guess I'll just buy it myself. I really dislike wearing foundation, and I really only wear concealer and blusher and moisturiser on my skin. But I need a bit more weatherproofing in winter and I need a bit more coverage. Whilst this will still be light on my skin, it will give me the coverage I need. I've been reading rave reviews about it, so I definitely need to pick this up. Oh my god that dress!! I cannot believe thats Evans. That dress is so beautiful and like you said so versatile! I'd love to see this with leather and a heel. You have great taste in watches too! I've been lusting for the exact same one. Lovedrobe has done it again. I've been loving the fact that other plus size brands are stepping up their game and competing with ASOS Curve. We want options right? And yes, this dress is a killer. With the bow belt it's a perfect balanced look.